The fact is this, the BLM gets away with their tyranny and bad decision making via the Department of Justice. It is having to go to court to fight against their bad decisions that makes, most often and when not affordable for the common taxpayer, harmful to wildlife and our Public Lands. BLM employees must be made to take responsibility for their decisions, and that means taking-away their abundant access to Department of Justice Attorney’s, paid by our tax dollars. They must take responsibility for either their bias and narrow scope of decisions, primarily for special groups, or their false information that they spread throughout public documents. The Gettysburg Address was designed to protect the common folks from the questionable conduct and venues’, then and now, from government agencies such as the Bureau of Land Management and the Department of the Interior. These government agencies say those Advocates that call for justice are “radical” or worse, provide the public a “sky is falling” context. The truth of the matter is this, Advocates are American’s, they are demanding the BLM and DOI to stop conducting a costly stream of misinformation to the public at large, stop breaking laws, stop abusing animals, and adhere to the very foundations of what America was established upon! We find beyond a doubt that BLM Media people and DOI media people take almost verbatim from the WWII Nazi propaganda machine, how to disseminate information to the public. We all know where this leads, don’t we? 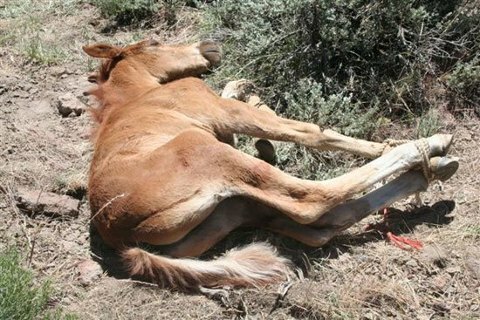 Not to be ignored is the illegal activity that transpired here, in regard to false information given to the government, but as usual the BLM employees and private contractors ignored, and at the expense of many horses being crippled and killed as well, including foals. This is unacceptable, and there is just no excuse for this type of incompetence and/or attitude within our government agencies and their employees/contractors. To actually allow felonies to occur, and being paid for the felonies, is beyond doubt an unscrupulous and uncalled for situation. Also ignored is the illegal actions, that consistently ignore FAA Laws. The law is FAA PART 91—GENERAL OPERATING AND FLIGHT RULES § 91.13 – Careless or reckless operation.4 The law is quite clear, yet ignored. This Journalist says “ignored” because there exists video taped evidence, in abundance, on the Internet, which is not edited what so ever. This is a felony, and as outlined in FAA Part 91–#91.13, as well as within many state and federal jurisdictions on Vehicular Assault upon people or animals. In this Journalist’s opinion there is guilt written all over this situation, via photos, testimony, and many other documents to include questionable budget expenditures, consistently — and why? Because those abusive situations did happen, and will happen again because these people get away with the abuse, supported by the BLM administrators! And, I might add, get paid with tax payer dollars quite well, for abusing the horses. Ignoring this situation, outright felonies, simply escalates the problem. Since the 1990’s Horse Advocates have been documenting and photographing and video taping Wild Horse Herd Roundups. Throughout this time Horse Advocates have been asking for a current investigation (one was done in the early 1990s, over 1,000 felonies found, in excess of 400 or 500 misdemeanors found, but canceled the night before taking this particular paperwork to the Federal Grand Jury—well documented and on peers.org). What is and remains false, and shrouded by a constant stream of lies and misinformation, is the BLM and the DOI conducting Wild Horse Herd Roundups, and the information as to why they are being conducted. Is there something not understood by BLM/DOI employees and their status as Americans, or is greed and criminal conduct exceptable within these government agencies. And of concern, why are criminals and people like these even hired within a government agency, and worse, allowed to run sli-shod, ignoring laws, and using taxpayer money to do so? These questions need to be answered! Credibility in the same sentence as the Bureau of Land Management (BLM) has been and will be an oxymoron for generations to come. If virtues such as ethics and responsibilities and laws are not changed within our government agencies and their actions, then what we get is what we deserve if we do nothing about this situation. Gone are the days where government employees, especially those who work within the BLM, can be trusted or believed. Keep in mind this article is discussing an agency that remains the most sued and litigated agency in history. Their explanation (excuse) is that land issues are and always will be heavily litigated. The problem is, upon even a simple investigation, their statement is incorrect (gee, what a surprise). It is this agencies approach, and callous attitude toward the taxpayers, by bending or ignoring laws meant to safeguard the public at large, are the reasons they use taxpayers hard earned money in order to defend themselves in court, in the millions of dollars. So as a psycho or child would do, BLM employee’s attack Horse Advocates, as having no credibility – well here are other subjects, other environments, other situations, and other people with a diversity of backgrounds, who say the same things Horse Advocates are saying. In reality the litigations and lawsuits conducted against the BLM have mostly been developed due to BLM decisions favoring pre-selected and small private interest groups only. Then the American general public pays with their hard earned tax paying dollars, an estimated $112 Billion over the past few years and counting. The fact is, and made very clear through documents available to the general public, non-profits, other organizations, and advocates have to step in and correct their bad behavior and their bad decision making process by the BLM, often through litigation. So public relations people and BLM staff tell the public, just as a little child caught in a bad lie would do, how it is everybody else’s fault. Yes, BLM people say the non-profits, the organizations that demand truth from the BLM, or the advocate’s who demand explanations on their prevalent mismanagement of America’s wild horses, lack credibility; or worse, all of these organizations and people, and the American public in general are all lying. Ironically, you can almost see a small child standing there, in their broad BLM logo across their t-shirts, shorts, and dirty sneakers, while wiping their eyes of gator-tears, and hoping their lie acceptable. They then hope, beyond all hopes that the people they just lied to do not read the actual information that is out there, the reality, against the BLM and their recent decisions. 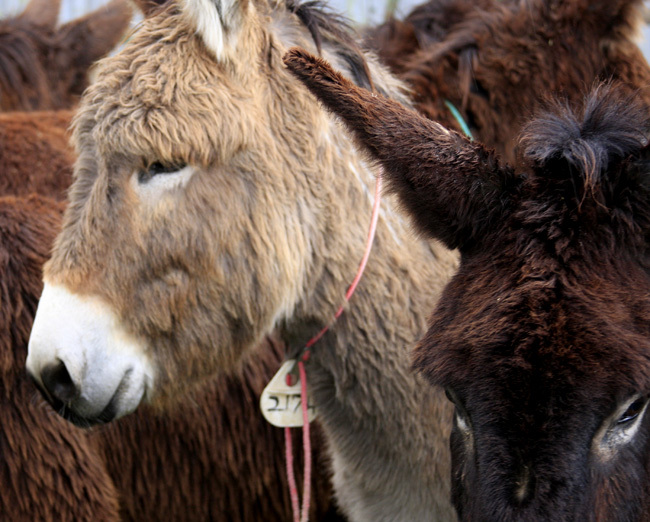 Examples are plenty in regard to BLM incompetence, bad decision making, catering toward a narrow scope of interest groups only, abuse of animals, questionable and often illegal conduct by employees, and the list goes on and on – and by the way, well documented – the key here is the term “well documented”. There are many, many wholesome documents and reference material available to the public; at last perusal it appears an easily concluded 60 to 1 ratio (60 articles arguing “against” every 1 article or decision BLM places into public scrutiny). We, as Americans and taxpayers, had better start questioning agencies such as the BLM and their use of our tax money. They spend frivolously in the billons of dollars, as well as distributing their lies or misinformation given to the public about what they receive, and how they spend our tax dollars. This is yet another profound statement by this particular government agency. This journalist, as well as many others, to include Congressmen and groups who’s purpose is to protect our environment, without a doubt conflict with just about everything the BLM does, decides, or spends money upon and in a frivolous and most often arbitrary manner of incompetence. One has to question their training, ethics, and what types of people are being hired at the BLM. This is extraordinary, as there is a robust amount of documents and reference material that directly opposes just about everything the BLM does, decides, or spends money upon. Often government researchers also write contrary articles or make statements that are in direct conflict with BLM’s Staff decisions (see www.peer.org for robust and profound articles on BLM, and by the way also written by previous BLM & government personnel). A recent decision making document describing the transfer of water from public lands to a small special interest group, researched and written by BLM Researchers (poor quality at best) and shoveled to the public as a reality, is scrutinized by other ecologists well known in this same field of research. This is what we are paying for, as taxpayers; make no doubt, in the billons of dollars. This water situation is only good for a small amount of people and for only a short time period, which undoubtedly and unconscionably by the BLM and other agencies supposed qualified scientists, state as a very high potential outcome. This is by definition, an extreme conundrum of thought, to say the least. Why? Is there a better alternative? Well yes, and it has been pointed out by many advocates and organizations alike – but of course, according to the BLM, “they” (those scientists and other groups or advocates) all lie or lack credibility. This is what we all define as credibility issues, in regard to the BLM, and consistently within almost every decision they have made. Let’s be clear within this article, telling the truth about BLM is not a credibility issue. 9. There exists much more, too much to go into here.